As this is my first blog let me introduce myself properly. 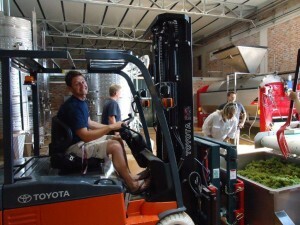 I am Charl Coetzee, winemaker at Balylonstoren. I have been making wine for eight years – most of this time was spent at two estates in the Stellenbosch wine region. I have also had numerous vintages in Europe and New Zealand. 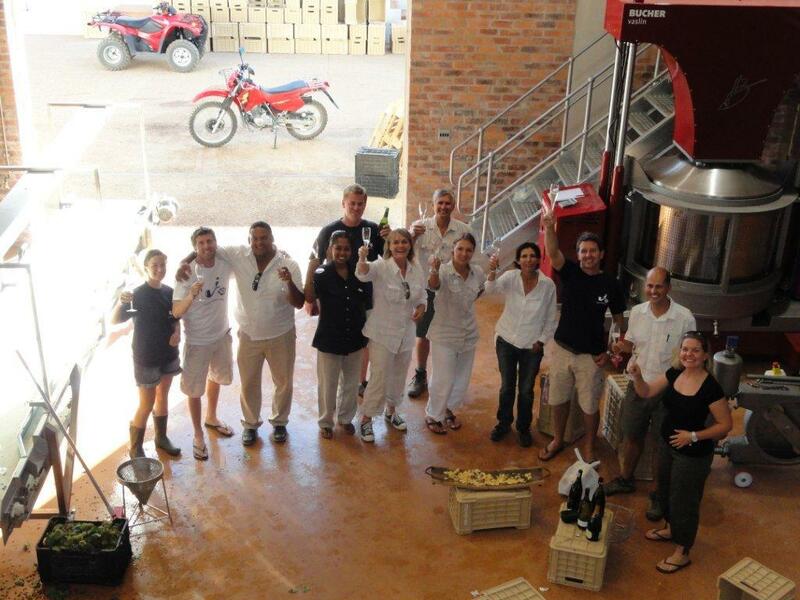 The current harvest is my first at the brand new cellar at Babylonstoren. 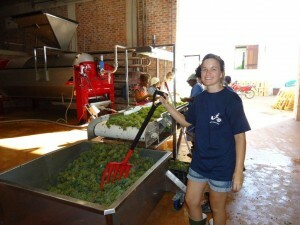 Having made wine in Stellenbosch means I am used to harvesting from the beginning of February to mid-February each year. I knew I could expect an earlier harvest at Babylonstoren because it is in the much warmer Simonsberg-Paarl region. I knew there were many exciting challenges ahead of me and during my short festive break, I comforted myself that I would be able to ease slowly into harvest and have enough time to prepare. I was wrong about the “easing” bit. Early on Tuesday, 4 January 2011 I had a great surprise . . .
As I entered my office I saw a little post-it note on the edge of my desk where the wind had blown it. I set up all my equipment and took my first sip of coffee before reading the note. On it, was the sugar (degree of ripeness measured in °B) of the Chardonnay blocks we planned to harvest for the base wine used for making sparkling wine. The values were from the previous week. I was in a state of shock and excitement and immediately called my wife. I told her that we were going to start harvesting the following week! My plans for an easy, calm and collected morning turned into a frenzy! I had to go into my brand new cellar – which, by the way, was still being built – to check what I actually needed to start. I had to make about 1000 phone calls to get everything I needed to really get things going. 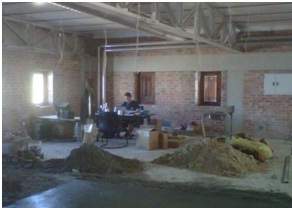 We set up office amongst heaps of sand and bags of cement (photo left). The floor of our future office was still being laid, but promises of red high-back chairs and leather couches helped us to cope with the somewhat, well, rustic situation. Every time I wanted to use my computer, I first had to blow away a layer of sand before I could see the keyboard! And then we started (the bunches of grapes on the photo above was officially the first bunches that was put through!). On the first day we did 4.6 tons and only went home at 22:00. Two days later we almost did 13 tons and went home at 19:00. It was clear that we were speeding up our work. I can now pr oudly report that we have most of our systems in place and every team member knows what his/her responsibilities are. A first harvest in a brand new cellar does not come without hassles. These included cooling plants’ electrical supplies tripping during the night resulting in white fermentation; an unexpected and dramatic increase in temperature; using our stem bins as fermenting containers (our Cabernet Franc harvest was very small due to the block being young); power failures; machines that inexplicably stopped working at critical times; and a stomach bug that thinned out the number of helping hands for a day or two. However, we are slowly but surely making history at Babylonstoren. And we are having lots of fun in the process. Watch this space for more information on how the cellar as well as the wines are developing in the days to come.